Vietnam’s participation in the Southeast Asian Games is only its second time yet; however, the team, including local and overseas Vietnamese, is expected to make a big bang in Malaysia. Basketball has been catching on in Viet Nam for a year now. It was mostly an amateur sport, popular among students and basketball lovers. It was not until the 2015 Games in Singapore that a men’s team under coach Tony Garbelotto was sent to compete in the event. They were placed seventh in the overall standings. In 2016, the Viet Nam Basketball Association’s first professional basketball league was held. Five teams took part in the event, and it was played over three months, turning out to be a festival for both players and supporters. 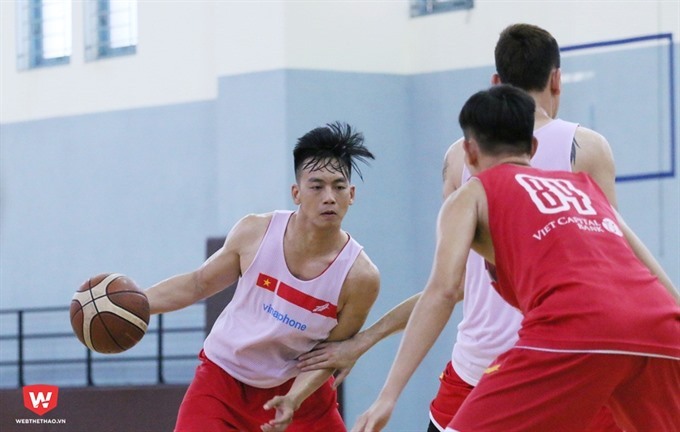 “It will be difficult for us at the games, but we have set a target to try and enter the top four,” said Dang Viet Ha, general secretary of the Viet Nam Basketball Federation. “As a long-term strategy, we will work hard to compete for the championship title in 2021,” he added. Ha said the Viet Nam Basketball Association (VBA) was a key element contributing towards the development of the game in the country. “The VBA lured thousands of fans to gymnasiums, which was unprecedented. It was also a great competition for players to sharpen their skills. I am sure that local players have learnt a lot from the overseas Vietnamese. First and foremost, it improved the quality of national basketball,” Ha said. The team is practising in HCM City under American Todd Purves, who is head coach of the Hanoi Buffaloes club. Purves is originally from California. He coached and scouted in the NCAA and the NBA for 15 years before coming to Asia. The National Basketball Association (NBA) is the major men’s professional basketball league in North America and is widely considered to be the premier men’s professional basketball league in the world. The NCAA is the National Collegiate Athletic Association, the highest university level. “We are currently preparing in HCM City. We practise twice a day. I am introducing new offensive and defensive systems,” Purves told Việt Nam News, adding that he loved the Vietnamese people and living in this country. Purves, who has won ASEAN Basketball League and has been named Coach of the Year in multiple countries, said he had no major problems and was proud of the effort put in by his players, local and overseas. “Many of the other ASEAN teams have been using overseas players for several years. It was important that we include overseas players, so that we can compete at the same level as the other countries. These players have shown a commitment to Việt Nam basketball and the community as well, and we are happy to welcome them,” he said. Purves praised local players such as Tô Quang Trung and Nguyen Van Hung, as players with outstanding ability in defence, while terming Trieu Han Minh and Lê Ngoc Tu, the best local players. Purves has also saved a slot for three overseas Vietnamese Horace Nguyen Tam Phuc and Stefan Nguyen Tuan Tu of Saigon Heat and Tam Dinh from Cantho Catfish. All of them made a mark in the first VBA season. Among the trio, Stefan has been highly appreciated by coaches and fans. He was a key player for Danang Dragons, which won the first VBA tournament. After the end of the season, he moved to Saigon Heat to take part in the ASEAN Basketball League and his team reached the semi-finals. “They provide both experience and confidence. Stefan and Horace are coming after the VBA championship, while Tâm was Heritage Player of the Year,” said Purves. He added that Stefan, Horace and Hoang Nguyen gave the coaching board depth at the point guard position. Hoàng from Hanoi Buffaloes has just been added to the team last week. He is the most popular player of the year. According to the coach, who is currently the head coach of Hanoi Buffaloes, the national team has challenges in terms of size and experience. “We hope to capitalise on our defence, as well as the willingness to pass and be unselfish on the offensive end. We are built on the principle of selfless team game. I don’t know who our best players will be, as individual success is not part of our game plan. I expect various players to lead us statistically, as we continue to put our teammates before ourselves,” he told Viet Nam News. "We are in Group B along with Indonesia, Singapore and Cambodia, all of whom we lost to in the last SEA Games. Laos is also in our group. Obviously, to advance, we must beat those top three teams. It will be a huge challenge, but we are working hard to give ourselves a chance." The team will have two friendly matches next month to warm up for the SEA Games. They will play Saigon Heat on August 12 and HCM City Wings three days later at the Hồ Xuân Hương Gymnasium. Purves said he did not care about winning or losing in these matches. He wanted to work on the team’s execution and preparation for the SEA Games. In Malaysia, the basketball event will be held from August 20 to 26 at the MABA Stadium in Kuala Lumpur.